Keillor forgot to mention how much a cat can help. 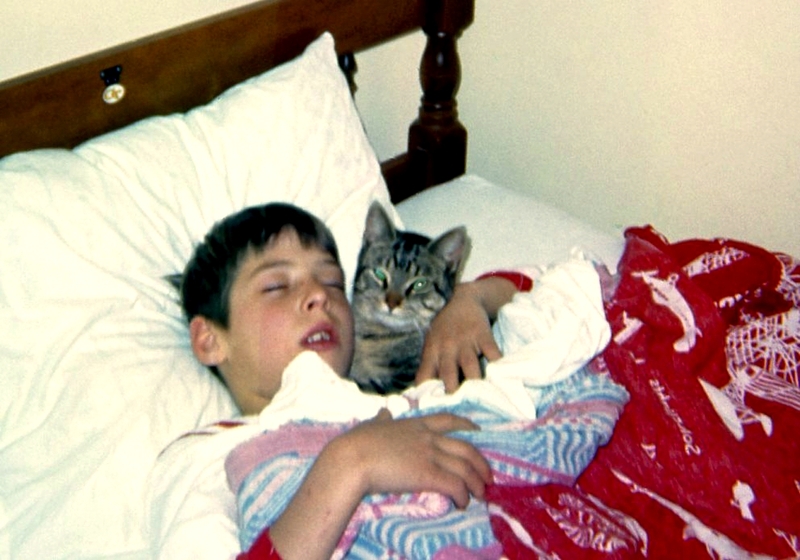 Al with his favorite cuddly cure, 1969. I totally agree with Keillor about this. The problem is, a disastrous day usually leaves me frustrated, agitated, angry or in some other state not conducive to a good night’s rest. All the more reason to learn effective methods of coping with stress in a way that is responsive without being reactive. I’m making progress, but it’s a long uphill effort. The worse the day goes, the more likely I will be up late trying to redeem what I see as too many failed efforts and too much wasted time. Children are good role models to keep in mind here, especially very young ones. Almost every baby I have ever known is the happiest, cutest and most delightful after they awaken from a good, sound sleep. And when they are cranky and woeful, sleep is almost certainly the remedy they need most. Most all of them seem to reach a point of auto-shutdown. No matter how hard they are fighting it, they keel over into a zonked-out visit to slumber-land. I do that same thing occasionally, but not nearly often enough. I’m going to try taking a cue from our grandson, sleeping my troubles away, insofar as I am able. I’ve learned to leave the evening hours to calmer, more relaxing pursuits if I possibly can, to give me a fighting chance of drifting off to sleep at a reasonable time. Of course, sometimes a day becomes disastrous much too early for bedtime, and there’s no possibility of napping. In that case, there’s nothing for it but to somehow get through the afternoon and evening. This is the day that God has made. Don’t you just love Pooh? I hope kids will always read him (adults too!) because he has so much to teach us. Wish I could leave the day’s worries behind as easily. Good morning, Julia! Many’s the evening when I’ve taken Keillor’s philosophy and headed to bed (probably causing my loved ones to breathe a sigh of relief!). Susan, I feel just a bit better knowing I’m not the only one who has to be pried out of bed in the morning. Jeff is amazing; even over the past two years, he has had a much easier time getting up in the morning than I do. At least feeling tired makes it easier for me to get to bed at a reasonable hour…usually! Sweet dreams to you too! Alan, isn’t that a comforting thought? When I was a little girl (very young, like 4 or 5) I used to beg my Mama to stay up all night. I was an anxious child, and somehow I felt that if she was awake, everything would be OK. She would always tell me “OK” when I asked her, and I believed her. My sister used to tell me that was a ridiculous request, that Mama HAD to get some sleep sometimes, and that she didn’t really stay up all night. So I started asking her to stay awake until I got to sleep. Which she always did, as far as I know. 🙂 So the thought in that quote is comforting to that little girl who is still there somewhere inside me. Sleep is a gift. I value it more and more as I age, too. I used to think I was missing out on life if I went to be too early, but now think the opposite. It feels good to wake up refreshed. Julia, one suggestion is to find a couple of mediation apps for your phone. If you have a smartphone, you can put it on do not disturb, excuse yourself to a quiet place and in just 15 minutes reap the benefits of a restorative calming of the body and mind. Alys, believe it or not, I STILL don’t have a smart phone (and rarely even turn on my cell phone), but I do think I should silence the landline phone and take some quiet times at home, even when I can’t take time for a nap. I can probably find some apps that will work on my computer or Kindle or Nook. I already have a “rainy day” computer sound that I love. My feelings about sleep have evolved in the same way you describe yours. Now I worry about missing out on sleep time! I think quiet time is a great idea. Because today is election day, our landline was ringing off the hook. I took three of the four headsets, lined them up on the kitchen counter, and muffled them with a shoe box. Problem solved. I wish I had thought of that. My phone was driving me CRAZY!!! Every time it would ring, I would remind myself that I was grateful that people were engaged in the process and that it’s a privilege to be able to elect our leaders, no matter how much work and expense that involves. That didn’t stop the phone from making me batty, though. Thanks for that link – good info to read and keep in mind. I can personally attest to experiencing health hazard #1 and #4 from lack of sleep, and I need to focus on warding off #2,3 and 5. He really was sweet, wasn’t he? I’m glad I had at least one younger sibling. Julia, do I dare say that I don’t have a sleep problem? I’m just blessed that way and hope I never have insomnia. I would probably call 911! “What’s your emergency, ma’am?” “My eyes won’t close, sir!” Southern dialogue, can you tell? 😂 I loved your blog and the comments! Sheila, it was great! NO, I did not think of it as a “boxed yard sale” but come to think of it, what would be wrong with that? You know what they say about “another man’s treasure!” Thanks again. BTW the butterflies are absolutely exquisite!